EdS ships worldwide through the guaranteed courier service Fedex. The orders placed and paid with immediate credit (paid by Credit Card) within 2 p.m. are despatched the same day , once the customer receives the email of order confirmation. The orders placed and paid with immediate credit (paid by Credit Card) after 2 p.m. are despatched the day after. The orders placed and paid with bank transfer are despatched as soon as the credit is accepted. Usually the credit times are 2-3 working days. The despatch costs include the insurance against any damage caused by the courier for the entire amount of the parcel and the despatch costs. 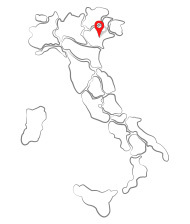 Emporio dello Scooter is responsible for the shipment from the moment in which the parcel is despatched to the moment in which it reaches the destination. • Pay attention to low-cost despatches! They are convenient but what do they really guarantee? The majority of sellers accept no responsibility for damages or loss of the parcel. In this particular case the responsibility is ascribed to the customer, who will have to personally contact the courier. 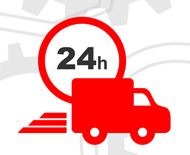 Delivery times vary according to the destination: 1 working day for deliveries in Italy; 2 working days for deliveries in the islands; 3-5 working days for international deliveries. The customer receives the parcel to the address registered on the personal profile of emporiodelloscooter.com. If the customer wants the parcel to be sent to a different address he/she can modify it while placing the order. As the courier delivers mornings and afternoons (until 7 p.m .) a person must be present at the address provided by the customer. The courier makes two attempts of delivery. If the customer is missing or the address results wrong after the second try the parcel will directly return to Emporio dello Scooter. If the parcel has not been delivered within the time expected (see the above mentioned delivery times) contact us sending an email to info@emporiodelloscooter.com or calling at our office (tel. 0423 639510). We are not responsible for undelivered parcels when the address is wrong or the addressee is missing. In this particular case the despatch costs, which include the costs to return the parcel to EdS and those to send it again to the addressee, will be charged to the customer. The customer must check on the basic integrity of the parcel at the moment of reception. If the person receiving the parcel observes any sign of damage, the package must be ACCEPTED WITH A RESERVATION contesting the courier and informing us by email: info@emporiodelloscooter.com.